Perfect for high school students who are applying for their first job, this gray-header cover leader has sample text for a student who is entering the workforce.Match the set! Create a unified and professional application by pairing this cover letter with the matching resume here. More sample cover letters can be found at CoverLetterExamples.net. 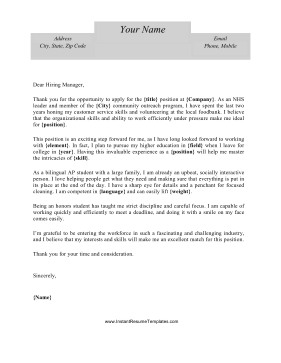 This cover letter template is available free for download. Available in Microsoft Word (.DOC) format, just downolad it, open it in Microsoft Word (or another program that can display the DOC file format,) and print.